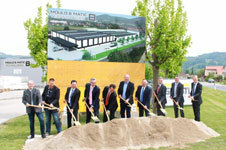 Austria-based Mould & Matic Solutions GmbH, a specialist in tool and plant engineering for the packaging industry, is keeping abreast with the global success of its parent company Kiefel Group and has recently launched the expansion of its site in Micheldorf, Austria. Completion is scheduled for May 2019. Generously proportioned assembly halls for the construction and commissioning of plastics processing machines are being built on a total area of approx. 3,355 sq m. Additionally, a new customer centre and office space for engineering, international sales and project management will be built and the technology centre will be expanded. Mould & Matic has belonged to German machinery company Kiefel since 2016. The newly created assembly areas and the focus on the cup and bottle market segments reflect the growth of the automation technology and tool specialist, Mould & Matic, in cooperation with Kiefel Packaging, it adds. The core competencies of the company include the development and production of thermoforming and injection moulding tools as well as automation solutions for the production of plastic packaging, which are used not only in the food and cosmetics, but also in the pharmaceutical and medical industries. "We are a partner for turnkey solutions and guarantee our customers a comprehensive portfolio of products and services, including tooling, machines and automation solutions", emphasised Olaf Tanner, Managing Director/CEO at Mould & Matic. "With its clear focus as a competence centre for the cup and bottle business within the Kiefel Group, we are convinced that our customers appreciate this along with our proverbial pioneering spirit." Mould & Matic Solutions GmbH has 155 employees in Micheldorf, including 22 apprentices. The expansion allows the number of employees to be increased to 250 over the next few years.